The Tour of Utah has been dubbed “America’s toughest stage race” and for good reason. As a UCI 2.HC, only World Tour events such as Tour of California and Grand Tour events will draw more elite competitors. It also sits at altitude and the physics of high altitude will restrict performance for all competitors. Acclimating helps tremendously, but the laws of physics are generally very difficult to violate. Many people wonder, “how hard is that race, really” as they conjecture “I bet I could ride if they let me.” The second statement can easily be discounted with a couple simple arguments. First and foremost, in any bicycle event, no one “lets” you ride along. In fact, it is in their best interest to eliminate rivals from the contention via competition whenever possible. This race is not a career fair at the college student union but rather a job best left to the professionals who have earned their place on the start line. Anyone wanting to test their mettle on the course would have taken the Tour of Utah Ultimate Challenge. So what does it take to complete and compete at the Tour of Utah? We’re going to use WKO4 and dig into the data from the 4iiii power meter of Elevate- KHS Pro Cycling Team road captain and domestique rider, Joseph Schmalz. Now, let’s understand how a professional rider gets to a fitness level necessary and sufficient to toe the line at the Tour of Utah. In short, a talented UCI professional rider on a team that qualified to enter the event needs to earn a spot on the race roster. To do this, you’ll need to train. While the Tour of Utah was a big week for any athlete, Schmalz had already had some big races and training blocks as preparation. He started the 2017 season with a large base that included more than 150 hours of riding from New Year’s Day until just before Valentine’s Day. You can see in the labeled “Base” section above how the Training Stress Balance (TSB) (yellow) drops as the Acute Training Load (ATL) (purple) rockets up and the result is that the Chronic Training Load (CTL) (blue) climbs. 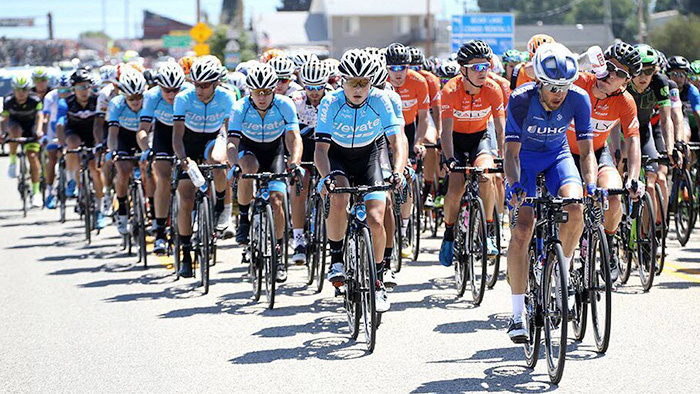 Schmalz’s second big push of the year was the UCI 2.1 Tour of Taiwan, which wrapped up his early season block and led to his early to mid-May Redlands+ build, where he continued to train through the Redlands Classic, making an 11-day block of racing and high intensity training. Due to an injury in June, he was sidelined from racing until US Pro Road Championships. Shortly thereafter, he went to altitude with the Elevate- KHS team to begin training for the Tour of Utah and the Colorado Classic. The altitude training consisted of three cycles, each progressing in difficulty. By the ATL and TSB, it looks as though the “Altitude Block 3” may have been as tough as the Tour of Utah. Because of years of training and racing at a high level, Schmalz was able to be effective in his role throughout the Tour of Utah in spite of his massive training load. His overall TSS for the Tour of Utah: 1491 for the week with an average Training Stress Score (TSS) (green bars) per day of 213. However, note the Intensity Factor (IF) (red dots) in the chart above. While ATL, TSB, and CTL are a good tool to assess fitness, they don’t tell you how fast a rider is or how much high intensity riding they can withstand before fatigue. That’s because these metrics rely primarily on volume. For the high intensity work, we’ll have to use WKO4 to dig a bit deeper into what the Tour of Utah demands. This is where it gets interesting. Intensity Factor can be used to measure how difficult a stage was in relative terms of percent of threshold power (FTP). This particular WKO4 chart does not model this with respect to altitude (most of Tour of Utah is at >6,500 feet) so these are sea level numbers. Even still, it was a tough go for everyone, everyday. Schmalz averaged an IF of 0.76 for the entire race with his “easy day” being 0.68 on day four. However, an IF of 0.68 for 240 TSS is still very hard. Of note, the last two days of Utah at 0.80 and 0.83 were incredibly tough. They were also the shortest stages at 62 miles (99 km) and 71 miles (115 km) and fantastic stages from a sporting entertainment value. Moving beyond IF, we examine how much high intensity riding it takes to compete and complete. To examine this in WKO4, we’ll take a look at exposure time near or above Joe’s sea level FTP. For the entire Tour of Utah, Joe spent 25 percent of the race, 7:18 at or over 90 percent of FTP. That’s a massive 63 minutes per day, which is equivalent to combining the high intensity efforts from Friday and Saturday at Tulsa Tough, for each race day in Utah. Schmalz spent 4:21 of that time above 105 percent of his sea level FTP, about 13.7 percent which averages to 37 minutes per day. The 105 percent number is important as it has been determined in numerous studies to be an unsustainable output for extended lengths of time. Finally, one last point is that the professionals at the Tour of Utah are fit enough to resist fatigue late into a race and late into each day. Excluding the time trial day, the road stages averaged 2,800 kJ. The minimum buy-in to complete the stages with the grupetto appears to be 4.8 w/kg on the climbs for 20 minutes or more, after 2,500 kJ of work, just to make it to the line. Adam is currently the Performance Director of the Elevate- KHS Pro Cycling Team. He has raced at the elite level since 2002 and graduated with a Masters in Exercise Physiology from the University of Kansas in 2005. His true talent comes with his ability to combine his vast experience with his knowledge of sport. He is indeed a student of science, sport, athletic performance, strategy, and tactics. He continuously educates himself by keeping up to date with current trends and methods in sport and his clients have reaped the benefits from this work with over 13 national championships in 8 disciplines on two continents. Adam is able to incorporate these attributes on a daily basis to help his clients reach and exceed their goals whether they are a beginner or a seasoned professional. Learn more about Adam and Source Endurance here.